New Balance Fresh Foam Zante Pursuit Review: Less Material and More Cushion - Through Laser Beams! New Balance Fresh Foam Zante Pursuit Review: Less Material and More Cushion – Through Laser Beams! 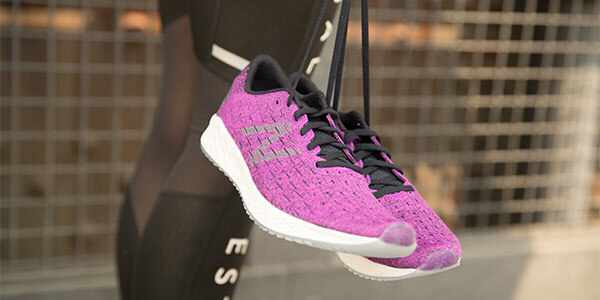 Run like you’re chasing – or escaping – in your New Balance Fresh Foam Zante Pursuit with laser engraved cushion and a sleek, seamless feel. I said the New Balance Fresh Foam Zante Pursuit replaces the Fresh Foam Zante v4, but that’s not exactly right. New Balance created a fork in the road to open up new possibilities. You now have a Zante Collection also featuring the minimal Zante Solas and the versatile Zante Trainer. There could be a Zante v5 eventually but as of now the Zante Pursuit is the closest thing to a Zante v5. Top to bottom the New Balance Fresh Foam Zante Pursuit is a different shoe. The Zante Pursuit ditches the saddle used on the Zante v4 in favor of an entirely HypoKnit upper. HypoKnit delivers big time with a seamless, sock-like fit through areas of stretch and support. Even if you have a wide foot like me, the HypoKnit stretches to accommodate while the rubberized eyelets hold laces in place for a secure fit. A nice touch throughout are the slits that make for easy venting and a fresh aesthetic. Here’s where things really heat up – yes, I’m talking about the lasers! “Full length laser engraved Fresh Foam cushion midsole,” sounds super cool, but what does it really mean? First, you get one entire slab of the best cushioning available from New Balance. Then, lasers are used to etch holes in the spots where your foot applies the most pressure. This creates many points of finely tuned cushion while eliminating excess material for a lighter shoe. This can’t be done with a molding process, so yes, your midsole is actually engraved by lasers. Just look through the semi-translucent outsole underneath and you’ll see. And by the way, it feels awesome! Because of the light minimal profile, this shoe feels great on the track, tempo runs, 5Ks, 10Ks, and you highly efficient runners will definitely go longer. This is a neutral shoe for medium to high arches and we’ve got it at Cushion Level 3 with 5 being the most, and 1 the least. This shoe is also easy on the eyes so anyone looking for a wear-around shoe can’t go wrong. I’ve found myself reaching for the Fresh Foam Zante Pursuit again and again, for trips to the grocery store, a casual work day, for dinner dates, and to head out the door fast for an impromptu run. The Fresh Foam cushion height has been increased by 2mm for more bounce to the ounce. A reworked heel collar keeps you locked in and free to focus on your run…or nothing at all. Once again, laser engraved midsoles! Seriously this is one technically advanced shoe whose performance is almost rivaled by its good looks. COLORS: Women you win, 5 for you. 3 colors for Men. Want to know for sure if the New Balance Fresh Foam Zante Pursuit are the right shoes for you? Take 2-3 minutes to run through our online SHOE FIT FINDER. You can also call 800.551.5558 or drop by your hometown store and we’ll guide you through your personal fitting.